Last week, fellow food writer Hannah Palmer Egan and I took a road trip to Brattleboro. Over three days and two nights, we ate our way through the city, looking for its best gems. It was a wonderful whirlwind trip, and I wished I had packed a suitcase filled with eating pants. What we found was that the little city well to the south of Burlington has a lot to offer, including handsome old brick buildings, a scenic river and friendly people . You can read that story here. Should you be planning to pass through Brattleboro — or maybe adding it to your upcoming Vermont Restaurant Week itinerary — here are some recommended sweet treats to keep in mind. I already professed my feelings for the Vermont Deli in our Brattleboro story. It has cookies bigger than your face, as well as pies and an enormous pastry case full of freshly made baked goods. What's not to love about this deli/country store/bakery? Those extra large cookies were chewy and soft. The locally made Mexican chocolates next to the counter packed heat — the kind that grows and grows with each bite. They almost made me cry, in a happy way. But what really sold me was the cherry pie. The Country Deli's pies are made in-house using as many local ingredients as possible. 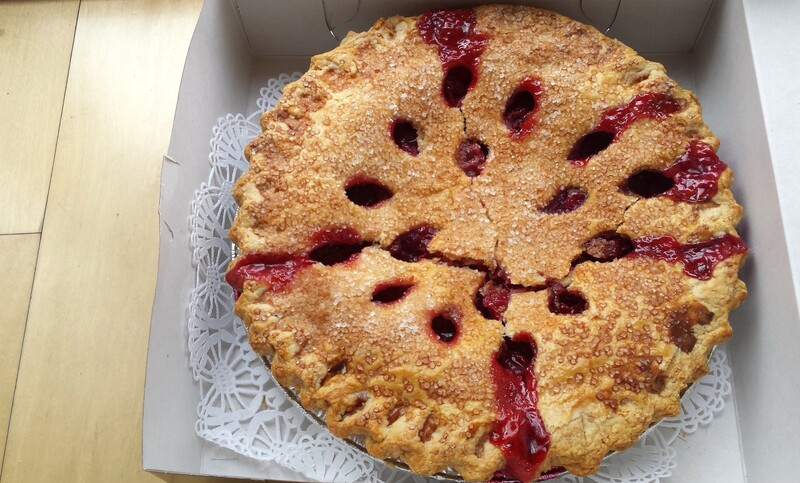 But of course it's not cherry season, so you might expect that sugary, canned goo in the pie's innards. And you'd be wrong! These cherries were tart, not swimming in sugar. The sugared crust, which I normally disdain, perfectly balanced the fruit's bite. After a single taste, I wanted to take the pie to my hotel room and lock the door so we could have some alone time. Recently I've been obsessed with the idea of putting breakfast cereal in dessert. I've been pinning up a storm on Pinterest all sorts of Fruity Pebble desserts that look like pure happiness. So imagine my surprise when I found a brownie topped with Fruity Pebbles in the pastry case at the Porch. While my inner child began jumping with joy, the adult in me thought it couldn't possibly be tasty. But on first bite, again, I was won over. The breakfast cereal studding the top was crunchy and added a bright layer of flavor. 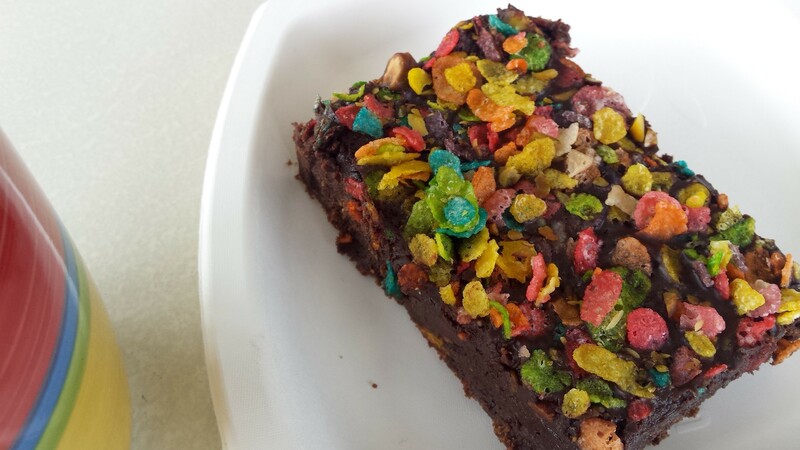 The brownie itself was close to a super-soft fudge, and its chocolaty icing layer held the Fruity Pebbles in place. There was something nostalgic and fun about this dessert. I would definitely go out of my way to get it again. Later I learned the Porch always has the brownies, but the toppings vary. Call ahead to find out the day's special. At the end of an aisle in the Brattleboro Food Co-Op, I spotted some local chocolates and other sweet treats. Among them was a basket of toffees made by Vermont Amber in White River Junction. I found a variety of creative flavors, including cacao nib and pumpkin seed chipotle, but my favorite was the toasty, salty sesame seed. Vermont Amber's website indicates it also makes a fennel seed toffee, but at the co-op, someone beat me to it. I'm sure I missed plenty, but, Brattleboro, I'll be back.